More and more traditional and non-traditional wedding couples are choosing to celebrate their Celtic heritage with a kilted bagpiper on their wedding day. 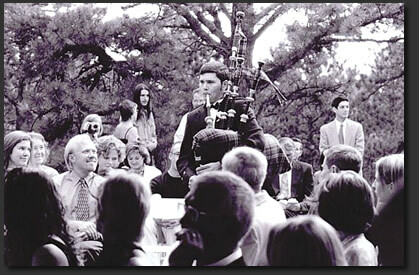 A wedding complete with an experienced wedding bagpiper in full-kilted regalia is as beautiful to see as to hear. The ancient sound of the bagpipes helps to accentuate the sacred institution of marriage, giving your wedding guests an experience to remember and cherish. 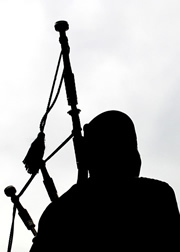 There are no steadfast rules to gracing a wedding with the bagpipes (short of hiring a skilled and experienced wedding bagpiper), and so the bride and groom have the freedom to choose a unique arrangement for their wedding day. With this in mind, I offer the the bride and groom a choice of kilt tartans (Irish County Cork, Caledonian - the National kilt of Scotland, Hunting Stewart or Black Watch) and kilt jackets (Black Jacket and Hat or Green Jacket and Hat - see photos) to select from, as well as a wonderful medley of ceremony music to choose from to grace the wedding processional, prelude and postlude. See below for audio samples! Guests Arrive to the Ceremony: As your guests begin to arrive before your ceremony, Scott will perform to greet them at the entrance to the wedding site/church/outdoor area, naturally drawing the wedding guests to the wedding ceremony site. The seated guests within the wedding site are also entertained as they await the beginning of the ceremony, and listen to the majestic bagpipes in the distance. Processional: The mothers of the bride and groom, the bridal party, and the flower girl proceed down the isle to the ceremony music - Scott can lead the bride and father down the isle, or perform from scenic area. 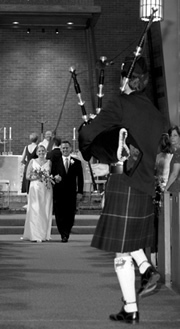 Bridal Processional: The bagpiper performs "Mairi's Wedding", or a song that the bride enjoys most. I will send you an audio guide CD which will allow you to hear a good selection of ceremony music on the bagpipes, from which you can then choose your bridal processional song. I often suggest "Mairi's Wedding", as it is a little different than the rest of the ceremony music, and serves to set the bride apart from the bridal party during her processional, however any song of your choice is great. Unity Candles/ Unity Sand/ Hand Fastening Ceremony: The bagpiper may perform a selection of slower, reflective music, which accentuates the lighting of the Unity Candles and helps to slow the tempo of the ceremony down for everyone to enjoy. Recessional: After the newlyweds are introduced to the guests following the kiss, the bagpipes strike up with a positive and high energy song of celebration (often "Scotland the Brave", for Scottish wedding couples, or "The Rakes of Mallow", for Irish couples). The bagpiper may lead the newly married couple up the isle at this time, or immediately follow behind the newly married couple up the isle, or the piper performs stationary. Postlude: Often the bagpiper leads the guests out of the wedding site along with the newly married couple, and ends up outside the wedding site in front of the guests. This serves to draw the guests outside the wedding site, where they will be entertained with lively traditional music as they await the newly married couple's first appearance from the wedding site, or for the receiving line. Piper can also lead the guests over to the cocktail hour in a long line - tell your ushers to tell guests to "follow the piper". 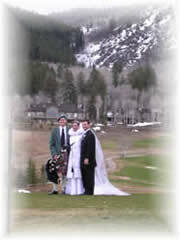 Reception: The bagpiper may lead the newly married couple into the reception, which makes a great impact. You may also have the bagpiper forego this introduction, instead simply having him perform for your guests as they enjoy their cocktail hour. Again, there are no rules, allowing you to express your individuality on your wedding day. With over 400 wedding performances in Scott's piping history, Scott has some great ideas to add a unique touch to your wedding. Call or e-mail Scott and you can both discuss your wedding in more detail 303-521-8346, call or text me anytime, scott@coloradobagpiper.com). How Much is It To Hire Scott to Perform for My Wedding?